John Fisher was a highly placed member of the Catholic Church who brought scholarship and prosperity to Cambridge University. But his life was cut short after refusing to accept King Henry VIII as Supreme Head of the Church of England. He was a famous preacher, scholar and theologian of European reputation, who introduced major reforms into the University of Cambridge. But eventually his theology brought him to the scaffold where he was executed for treason after falling out with the King. Fisher was born in 1469 in Yorkshire. His father, who was a merchant in the market town of Beverley, died when John was eight. He attended Beverley Grammar School, an old foundation believed to date from the year 700. Today, one of the houses at the school is named in Fisher’s honour. At the age of thirteen, he began to study at Cambridge. In 1491, after receiving his MA, he was ordained, and continued his academic career. He became Vice-Chancellor when he was only 32, and three years later Chancellor, a position he was repeatedly elected to, until in 1514 he was elected Chancellor for life. 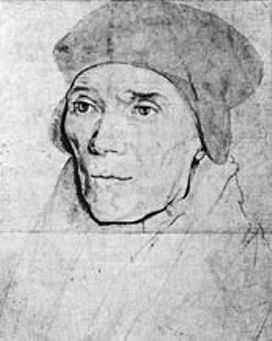 He was confessor to Lady Margaret Beaufort, the mother of Henry VII, and he directed her wealth and influence to the reform of the University. Two new colleges, Christ’s and St John’s, were founded, as were the positions of Reader in Divinity at both Oxford and Cambridge. Fisher was the first to fill the divinity chair at Cambridge. He endowed scholarships, provided for Greek and Hebrew in the curriculum, and engaged his friend, the famous humanist, Erasmus, as a professor of divinity and Greek at a time when the university’s scholarship was at its lowest ebb. In 1504 he was made Bishop of Rochester, and a few years later preached the sermon at the funerals of Henry VII, and of his patron, Lady Margaret. He helped Henry VIII in his defence of the Catholic Church against the reformers, a defence which earned Henry the title of ‘Defender of the Faith’ from the Pope. When it first became known that Henry was planning to annul his marriage to Catherine of Aragon, Fisher made it clear he totally opposed such moves. He helped Catherine plan her defence and preached openly on the matter. He wrote seven publications condemning the impending divorce. Fisher was playing a dangerous game. Eventually Parliament passed the Act of Succession, requiring clergy to acknowledge the legitimacy of the children of the King and Ann Boleyn. Fisher refused and was imprisoned in the Tower of London in 1534. In May 1535 the new pope, Paul III, created Fisher a Cardinal, but the following month he was tried for treason and executed by beheading on 22 June, aged 66. Two weeks later, his friend Sir Thomas More was executed on the same charge. They are commemorated together in the liturgical calendar on that day, 6 July.